And The Rose is jealous of its lash-like thorns. But I love her, for knowledge and love both come from her dust. The beauty of her trees makes me blush. How sparkling the water flows from Pul-i-Mastaan! For her mountains brought him near to heaven’s delights. Each brick is more precious than the treasure of Shayagan. Every street in Kabul fascinates the eye. In the bazaars, Egypt’s caravans pass by. And hundreds of lovely suns hide behind her walls. Her dark nights shine like beautiful hair. Fiery songs like burning leaves fall from their throats. I sing to the gardens, Jahanara and Shahrara. Even the Tuba of Paradise is Jealous of their greenery. 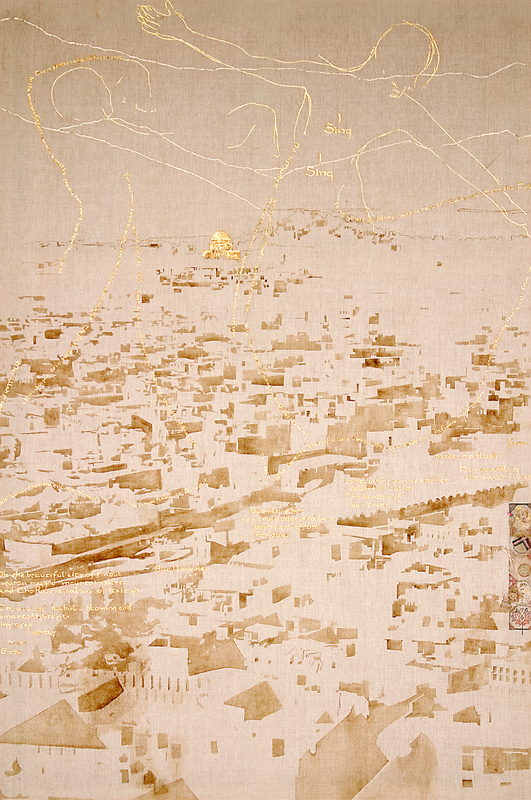 In this work, gold leaf micrography (text shaped into images) from a seventeenth-century poem illuminates the city, inspired by a panoramic photograph taken between 1870 and 1882. Celebrating Kabul (Afghanistan), the verses walk a main city road, not as an invading army but as a march of words of love. So, too, the poem delineates two dancing figures, with words of song upon one figure’s heart. Symbols of what was cherished by Afghans, then banned dance, music, books, kites are woven into the painting as if a pattern from a tribal carpet, an art form that helped to make Afghanistan renowned worldwide. Figures and mountains tower over the city as we pray for healing joy for the people, women and men alike, of Kabul.